We have 3 conference rooms for any occasion. Small Conference Room: seats up to 5 The Classroom: seats up to 35 The Penthouse: seats up to 18 All rooms come with Coffee and Water services as well as A/V and teleconferencing hardware. Our classroom is perfect for all medium to large sized groups who need a space to hold their meetings, groups, presentations, or gatherings of all kind. The space offers multiple white boards, free, secure WiFi, integrated video-conferencing, 24/7 access, and all the coffee that you can drink. Atmosphere/Decor: A large, open space with multiple white boards. Special Features: We offer free, secure WiFi, integrated video-conferencing, 24/7 access, and all the coffee that you can drink. 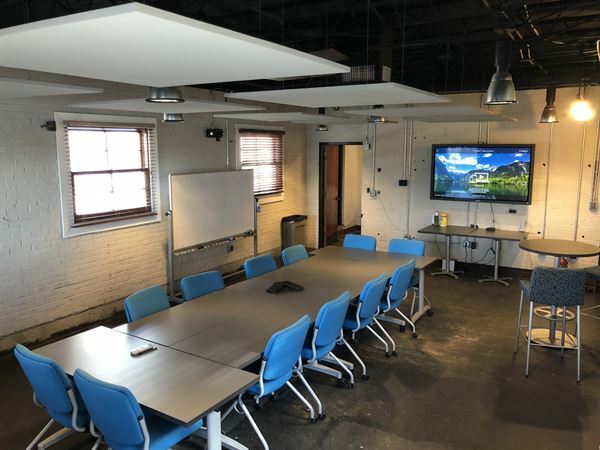 Our Penthouse room is a 500 sq ft space that's perfect for all your team meetings, presentations, client or company meetings, or any other group gatherings or parties. Our room is equipped with the fastest, most secure WiFi and video conferencing technologies in order to make any and all collaboration as easy as possible. Atmosphere/Decor: Situated on the 2nd floor of The Exchange 202, it offers a wide view of the surrounding downtown area. Special Features: The Exchange 202 provides fast, secure WiFi and video conferencing technology as well as all the coffee that you could want. Our small conference is perfect for small meetings, presentations, client or company meetings, or group gatherings of any kind. The room is equipped with the fastest, most secure WiFi, 24/7 access, integrated video conferencing technology, and all the free coffee that you could want. Special Features: Our room is equipped with the fastest, most secure wifi, 24/7 access, integrated video conferencing technology, and all the free coffee that you could want.